Rebecca Tavernini (Winter, 2014). Insight Kids. Northern Horizons, 14. Rosenburg, A. (May/June, 2014). 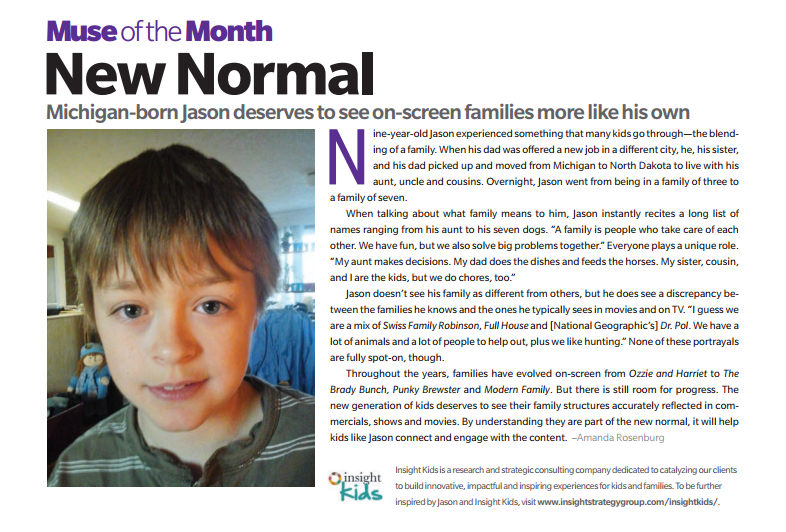 New Normal — Michigan-born Jason, deserves to see more on-screen families like his own. Kisdcreen, 39. Rosenburg, A. (April, 2014). Going the distance — New York teenager and role model Kat inspires girls to dream big. Kisdcreen, 52. Rosenburg, A. (February/March, 2014). 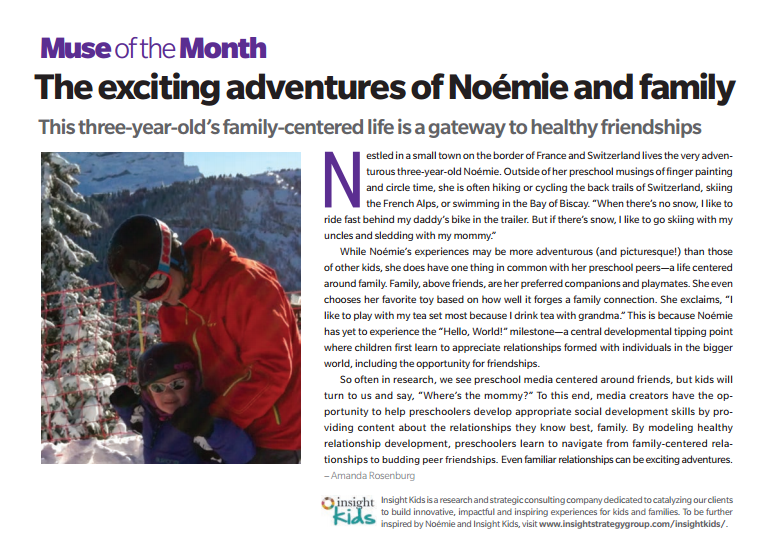 The exciting adventure of Noemie and family — This three-year-old’s family-centered life is a gateway to healthy friendships. Kidscreen, 64. Rosenburg, A. (September, 2013). 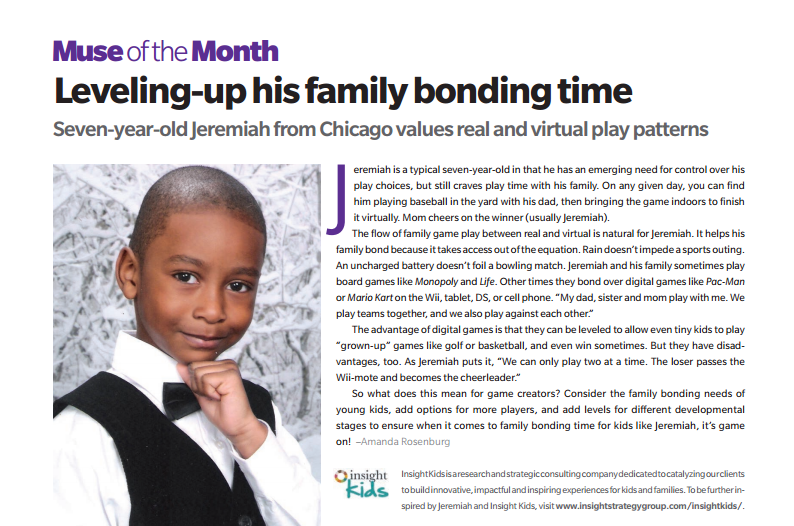 Leveling up his family bonding time — 7 year old Jeremiah from Chicago values real and virtual play patterns. Kidscreen, 67. Bailey, R. E., Perin, D., & Rosenburg, A. J. (2010, March). Content-Comprehension Strategy Intervention: A Model for Developmental Reading. 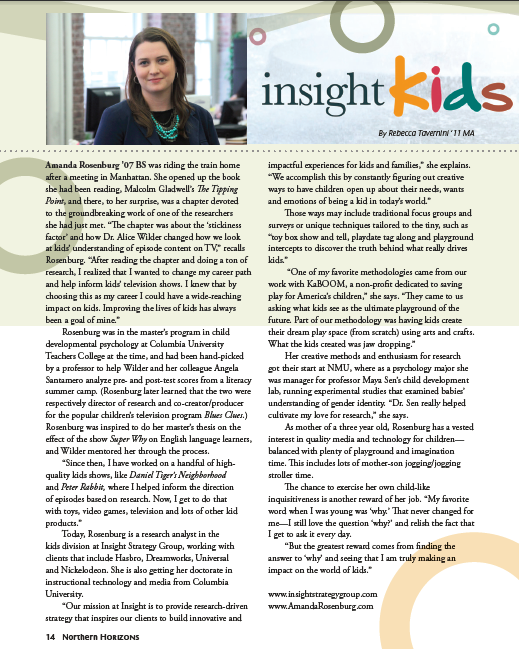 Talk accepted at the 34th Annual National Association for Developmental Education Conference. Columbus, Ohio. Rosenburg, A. J., Sansanelli, R. A., Cami, A. E., & Brown-O’Gorman, J. (2009, April). Super Why = Super Reading: The Effects of Multiple Viewings of the PBS Program Super Why on Preschooler’s Literacy Development. Poster accepted at the 68th Biennial Meeting of the Society for Research in Child Development. Denver, CO.
Rosenburg, A. J. & Sansanelli, R. A. (2009, March). The Power to Read: An Evaluation of Multiple Viewings of the PBS Television Show, Super Why! on Children’s Literacy Skills. Presented at Northern Michigan University Department of Psychology 2008-2009 Colloquia Series. Sen, M. G., Rosenburg, A. J., Fettes, E. L., Johnson, M. L., Dixon, C. M. (2008, March). Gender Salience as a Predictor of Early Gender Knowledge. Poster presented at the 16th International Conference on Infant Studies. Vancouver, Canada. Sen, M. G., Rosenburg, A. J., Fettes, E. L., & Blazek, M. J. (2007, March). A Self-Sorting Measure of Individual Differences in Very Young Children’s Gender Identity. Poster presented at the 67th Biennial Meeting of the Society for Research in Child Development. Boston, MA. Sen, M. G., Rosenburg, A. J., Fettes, E. L., Weymouth, L. A., Blazek, M. J., & Johnson, M. L. (2006, June). Toys for Me? Which Gender Category? : Toddlers’ Gender stereotype Knowledge in a Sequential Touching Task. Poster presented at the 15th Biennial International Conference on Infant Studies. Kyoto, Japan. Sen, M. G., Rosenburg, A. J., Adams, L. M., Lemanek, L. M., & Culik, A. C. (2006, June). Who’s That in the Picture? Toddlers’ Knowledge of Gender Identity in a Sequential Task. Poster presented at the 15th Biennial International Conference on Infant Studies. Kyoto, Japan.